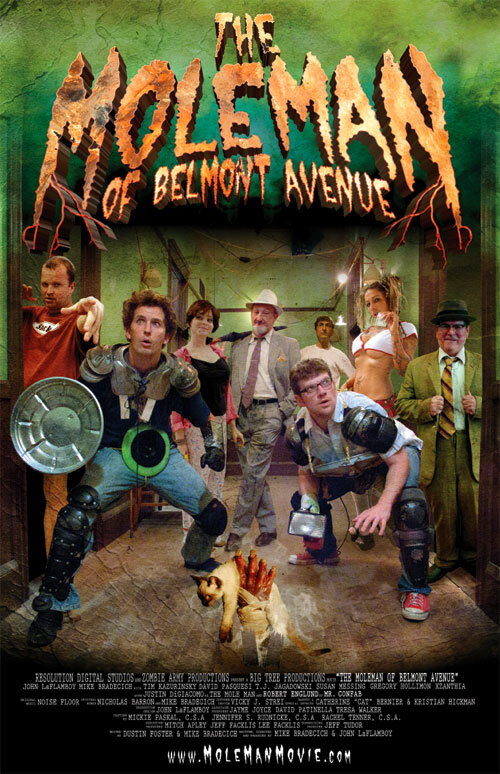 Mike Bradecich remembers the day his writing and filmmaking partner John LaFlamboy came to him with the idea for what would become the pair’s debut feature The Mole Man of Belmont Avenue. “The first thing he ever told me was the two of us are landlords in this building and all the pets are disappearing, because there’s a monster in the basement,” recalls Bradecich during a June visit to San Francisco where the movie screened at Another Hole in the Head, a film festival dedicated to horror, sci-fi, and fantasy. The partners wrote and directed the horror comedy, but also star as brothers who have inherited a Chicago apartment house from their mother. Well-meaning but incompetent, they already have their hands full just trying to keep the lights on in the building when they realize they have a problem with vermin in the form of a man-sized mole creature. They also cotton onto the fact that missing animals will be the least of it if they can’t figure out some way to vanquish this most disagreeable house pest. Robert Englund, A Nightmare on Elm Street‘s Freddy Kreuger, costars as one of the tenants. Saturday Night Live alum Tim Kazurinsky also appears as a homeless man the brothers recruit as part of their quest to conquer the Mole Man. Justin DiGiacomo, a Southern Illinois University classmate of LaFlamboy and Bradecich, plays the titular monster, his head encased in latex for 12-14 hours at a time during a sweltering July summer and fitted with white contact lenses that made him blind. “He was literally a mole man,” says Bradecich, who adds that DiGiacomo got so far into the character that he developed a back story that explained how the Mole Man came to live underground and how the Mole People’s distinctive look evolved. 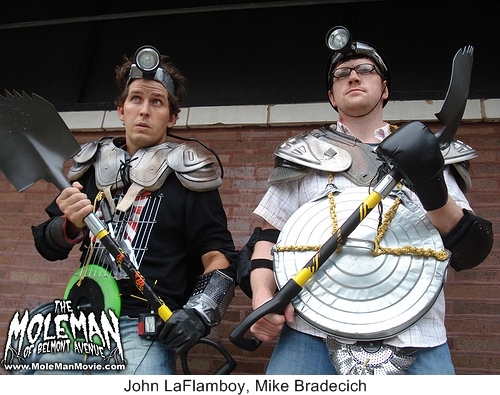 Next up for Bradecich and LaFlamboy is Haunted House: The Movie, a story based on LaFlamboy’s work as designer, director, producer, actor, and co-owner of Statesville Haunted Prison and City of The Dead, a Chicago haunted house. (“He’s the haunted house mogul of the Midwest,” says his partner.) For now, though, they are busy traveling with The Mole Man of Belmont Avenue on the festival circuit. Upcoming appearances includes stops at the Atlanta Horror Film Festival and the Chicago Horror Film Festival. Exuberant and funny, Mole Man demonstrates the pair’s talents as actors, writers, and directors, but it is also represents the next evolution in their partnership. Friends since college where Bradecich was an English major who acted and LaFlamboy majored in theater, the two began making shorts together in 2005 with one thought in mind.